Creamy marscapone with herbs, topped with a SO pretty zucchini layer, and baked in a flaky pie crust. 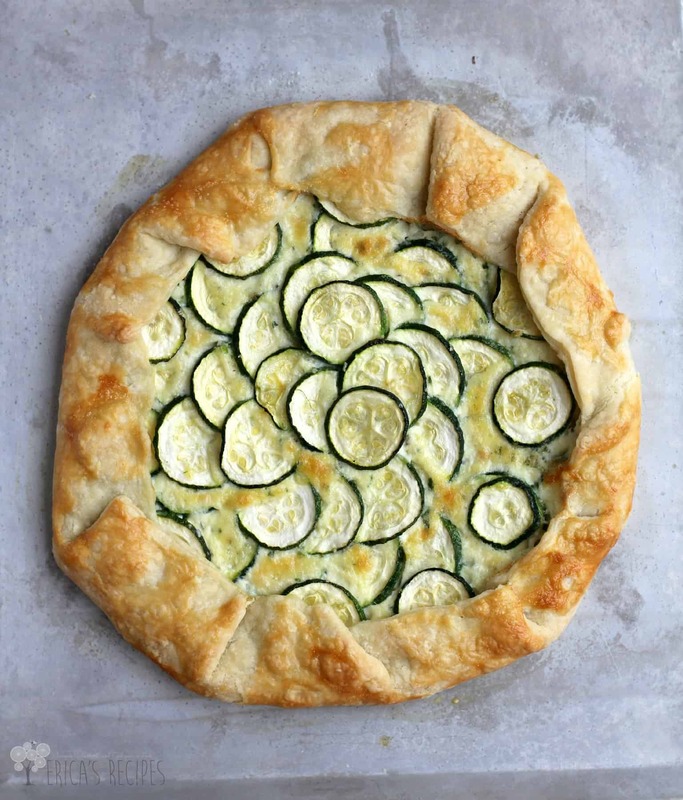 This super easy Zucchini Crostata recipe is divine, and lovely, and delicious, and all the things. First things first …why did I call this a Zucchini Crostata but my Blackberry Galette a galette? Because this recipe, with marscarpone cheese and fresh oregano, is decidedly Italian. Galette is French. That’s the only difference between the two. And what I love about crostatas and galettes or whatever you call them is that they are easy – no special pan required. Just a bake sheet. And they are rustic and sooo chic. As my 3 yr old son likes to say, Ooh la la. This was my first time ever cooking with marscarpone. I had never even tasted it until I had the idea for this recipe. It’s very good – similar to cream cheese but less assertive. It tastes more like actual cream. I think for cooking a dish like this, it’s perfect because by having that milder flavor, the marscarpone allowed the zucchini and herbs to just sing in this Zucchini Crostata. 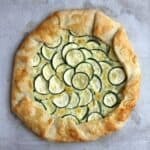 So if you are tired of quiche (don’t laugh, it could happen), or if you want to make a tart but don’t have a tart pan, this Zucchini Crostata is another way to go. With zucchini in season, now is definitely the time of year to showcase it in a dish like this. In a bowl, whisk together the marscarpone, egg, oregano, parsley, green onion, and salt. On a floured surface, roll out the pie crust dough to a large disk. Use a knife to trim the edge a little if needed to make sure that it is round. Transfer to a large baking sheet. Spread the marscarpone-herb mixture in the center of the dough to within 2 inches of the edge of the dough. Layer the zucchini, with the zucchini rounds overlapping slightly. Gently fold the dough edges in over a couple inches to form the crostata. Using a pastry brush, or in my case a cheap paint brush, lightly brush the egg white over all the dough. Bake at 350F for 50 minutes to an hour until crust is all golden and cooked through and crostata top is lightly browned. Yield: 4 servings. Ok, first of all, you need to come over and cook dinner for me. Yes, need! And second, you can make this or pretty much anything else you want when you do. And, third, I adore this Zucchini Crostada!!! MMMMMM! I mean, what could be better than my favorite veggies lightly tickled by mascarpone and all hugged gently by a flaky crust! mmmmmm! Pinning! Beautiful dish. This would be a great dish for guests because it looks so impressive! Holy cats woman that looks heavenly! I want a piece now!! Pinning! Hi Erica – this looks just absolutely fabulous! Visiting from the Weekend re-Treat party; thanks so much for sharing your recipe with us and pinned! Have a happy weekend! Stopping over from #foodiefridays. This looks SOOOO good. Definitely going to try. Pinned! This looks so good I want some right now! Ohhhh…this looks AMAZING and right up my alley. Can’t wait to make it- pinning for sure! 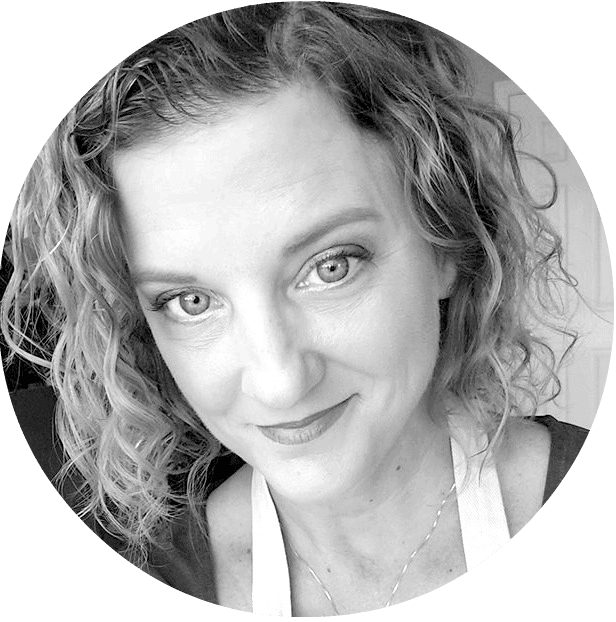 Thank you for linking this up at Snickerdoodle Sunday! This would be great party dish. Talk about your conversational piece. Thanks for cohosting over at the Snickerdoodle Sunday. Oh, zucchini and mascarpone never fail! This looks really yummy, I have to try it soon! Hi Erica – This is gorgeous! Thanks for sharing with the Let’s Get Real Party. Pinning. This looks FABULOUS! Stopping by from Foodie Friday! Delicious zucchini crostata Erica, thanks for sharing with Hearth and soul blog hop, I have shared in facebook, and pinning it. 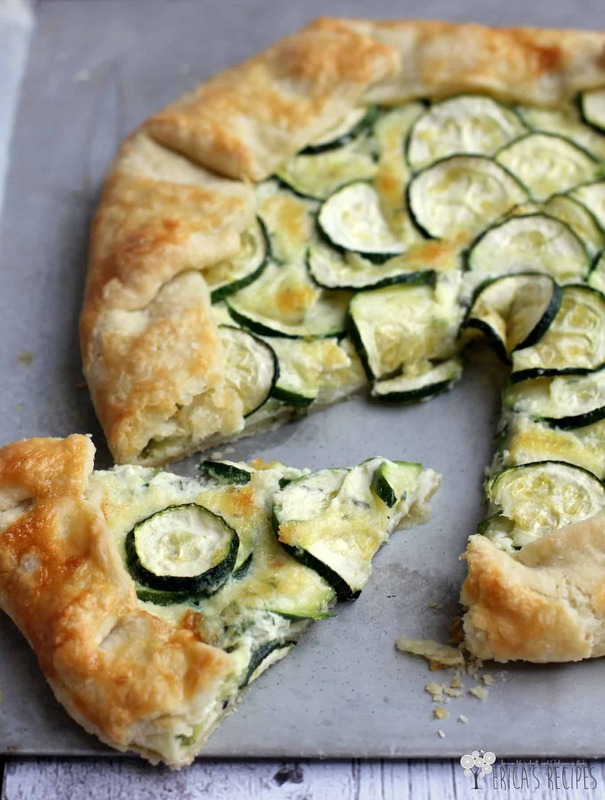 Erica, this Zucchini Crostata is gorgeous and looks even more delicious! Thanks so much for allowing me to add it to my zucchini round-up. Have a great day!